A team of British adventurers has set out to complete a schoolboy fantasy - journeying for 42 days from London to Timbuktu by "flying car". Led by pilot Neil Laughton, 45, of West Sussex, the team will make the 3,600-mile trip in a Parajet Skycar - a dune buggy with a fan and paragliding wing. 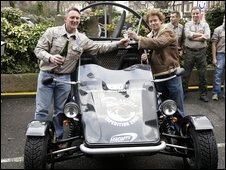 The Skycar and support team began their epic journey in London's Knightsbridge. The bio-fuelled flying vehicle was designed by Dorset engineer Giles Cardozo, 29, in less than two years. The team said it was the "world's first road legal bio-fuelled flying car". With the help of a giant fan-motor, ex-SAS soldier Mr Laughton plans to soar over the Pyrenees, before taking to the skies again to hop across the 9-mile (14-km) Straits of Gibraltar, then the Atlas Mountains in Morocco, stretches of the Sahara desert and on to Timbuktu in Mali. Speaking before the departure, Mr Laughton said: "I just can't wait to see their faces when we fly in and start playing football with them. "I don't think they will be able to believe somebody in a flying car has just visited them." Mr Laughton said the journey through the Sahara posed particular dangers. "We have been following the Foreign Office advice on the political situation in the area north-west of Timbuktu. "There is a significant kidnap threat... so we have to be very careful." Mr Cardozo will join Mr Laughton as co-pilot for the African leg of the trip. 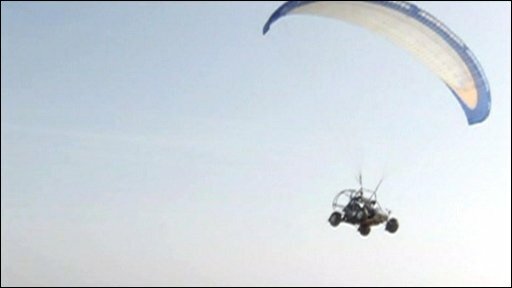 Mr Cardozo's Wiltshire-based firm, Parajet, makes the "paramotors" that propel the Skycar once it is airborne. The self-taught engineer has been dreaming of creating a flying car since childhood and plans to sell Skycars commercially at £50,000 each. Mr Laughton had also hoped to make the 22-mile (35km) flight across the English Channel, but he said that plan was vetoed by civil aviation officials.